Note: this is part four of a four-part series on A Master Guide: The Major DHT Reducing Mechanisms… Which Are Effective Against Hair Loss? Missed the earlier articles? Check out parts one, two, and three. Now we’re going to uncover the fourth (and final) major lever to reducing DHT for the purpose of fighting hair loss: increasing DHT metabolism. Increasing DHT metabolism often goes entirely overlooked, and without good reason. We’ll dive into new breakthroughs to increase DHT metabolism using bacteria and even certain foods and supplements. And in doing so, we’ll finish the final leg of our Master DHT Reduction Flowchart. Know which DHT-reducing mechanisms are worth our time and which aren’t. Finally, we’ll cover the most important part of all: why we should look beyond lowering DHT if we want to achieve a full hair recovery. Want the entire DHT flowchart? Enter your email. I'll send it over, plus a 55-page guide on reducing DHT. You'll also get my recommendations on which DHT reducers are safe, which aren't, and why lowering DHT isn't the key to achieving a full hair recovery. Increasing DHT Metabolism: What Does That Mean? Dihydrotestosterone (DHT) is made from testosterone. When free testosterone interacts with the enzyme 5-alpha reductase, it gets converted into DHT. Then that DHT binds to a cell’s androgen receptor. And that point, DHT can begin influencing that cell’s function – from sexual health to hair loss. We know that DHT levels are higher in balding regions versus non-balding regions of the scalp. And we also know that men who can’t produce much (or any) DHT don’t suffer from patter hair loss. And this is why most hair loss sufferers focus on lowering DHT in hopes of slowing, stopping, or reversing hair thinning. But here’s the catch: once DHT attaches itself to an androgen receptor, it doesn’t stay there forever. The reality is that this DHT eventually interacts with other enzymes, and then gets converted into other byproducts. The implication for hair loss sufferers? Maybe we don’t need to go about lowering DHT by decreasing free testosterone, inhibiting 5-alpha reductase, or decreasing androgen receptors. Maybe instead, we can go about increasing the chances that DHT interacts with enzymes that turn it into other testosterone byproducts. In other words, we increase the speed of DHT metabolism. We decrease the length of time in which DHT stays in our scalp tissue, and in doing so, we decrease its effects on our hair health. That’s what increasing DHT metabolism is all about. And while lowering DHT (to the extreme) by decreasing free testosterone, inhibiting 5-AR, and decreasing androgen receptors have all been shown to cause sexual side effects… The same can’t be said about increasing DHT metabolism (at least not yet). One way is to increase the expression of the enzymes which metabolize DHT. But as we’ll soon see, increasing some of these DHT-degrading enzymes might not help our hair. In fact, doing so might even hurt our hair. So let’s dive into it. For simplicity, we’ll stick with these enzyme’s short names: 3α-HSD and 3β-HSD. 3α-HSD is one of the enzymes that metabolizes DHT into different byproducts. And interestingly, there are substances inside foods that can increase the activity of 3α-HSD – and thereby increase the rate of DHT metabolism. One of these substances is called sulforaphane. Sulforaphane is found in cruciferous vegetables, but its highest concentrations is found inside broccoli sprouts. Sulforaphane increases the expression of DHT-degrading enzymes like 3-alpha hydroxysteroid dehydrogenase – at least in murine (rodent) studies. And in rats, sulforaphane supplementation increases hair growth! So we should expect the same thing to happen in humans, right? If we supplement with sulforaphane, could we’ll see hair regrowth too? Maybe. Maybe not. This whole equation actually gets a lot more complicated. Remember the enzyme 5-alpha reductase – the one that converts testosterone into DHT? Well, that enzyme comes in many different forms: type I, type II, type III, etc. However, there’s only one form of 5-alpha reductase that’s associated with pattern baldness: type II 5-alpha reductase. That same logic can be applied to the 3α-HSD enzyme. Research shows there are many forms of 3α-HSD, and two important isoforms are: AKR1C3 and AKR1C2. Both AKR1C3 and AKR1C2 metabolize DHT into other androgen byproducts – like the hormone 3α-androstanediol. This is a good thing! We want to increase DHT metabolism so that we can lower the effects of DHT on our scalp skin – and reduce hair loss. One of these isoforms – AKR1C2 – can also convert 3α-androstanediol back into DHT. When it comes to hair loss, that’s not a good thing. The more AKR1C2, the higher the chances that 3α-androstanediol will convert back into DHT (which is exactly what we’re trying to avoid). We can increase DHT metabolism by increasing the expression or activity of the enzymes which convert DHT into other byproducts. One enzyme that converts DHT into other byproducts is called 3α-HSD. But this enzyme comes in many forms: AKR1C3 and AKR1C2 (among others). And depending on the form, this enzyme will behave differently. When it comes to decreasing DHT levels, we only want to increase AKR1C3 – not AKR1C2. Why? Because both AKR1C3 and AKR1C2 can convert DHT into other hormonal byproducts… but only AKR1C2 can convert those byproducts back into DHT. For us humans, we have to be selective about which enzyme isoform of 3α-HSD to increase. If we increase AKR1C3, we might increase DHT metabolism and help our hair. If we increase AKR1C2, we might increase the conversion of 3α-androstanediol into DHT, and actually hurt our hair. So… Does Sulforaphane Increase AKR1C3 Or AKR1C2? We don’t know! While the sulforaphane-hair regrowth study on rats saw a dose-depending increase in two 3α-HSD isoforms (AKR1C21 and DHRS9), that study didn’t measure AKR1C2 or AKR1C3. And until we know more about sulforaphane’s effects on AKR1C3, AKR1C2, and other 3a-HSD isoforms, we can’t say for sure that it’s a viable hair loss treatment for humans. Personally, I think sulforaphane might help – and that in the future, studies will demonstrate its hair growth promoting effects on humans too. But until there’s stronger evidence, we have to exercise caution. With that said, some research teams are putting big bets on the idea that if we increase 3a-HSD, we’ll decrease DHT and help slow, stop, or reverse hair loss. In fact, one research team is taking this concept and developing a hair loss product. The most interesting part? It’s made entirely out of bacteria. One breakthrough in the biomedical field is that by using genetic engineering, we can now manipulate bacterial strains to begin overproducing certain enzymes… enzymes like the DHT-metabolizing enzyme 3α-HSD. This is exactly what a group of Israeli researchers are doing. They’re manipulating the bacteria Bacillus subtilis (B. subtilis) to overproduce 3α-HSD in hopes of 1) decreasing tissue DHT, and 2) promoting hair growth. I’m interested to see how the trial turns out. If this treatment works, it would be as simple as a bacterial spray. Let’s just hope they’re increasing the 3α-HSD enzyme isoform AKR1C3, and not AKR1C2. Now let’s add the 3α-HSD enzyme into our flowchart. What About That Other Enzyme… 3β-HSD? This is where things get even more complicated. Let’s refer back to that DHT metabolism chart. We’ve already covered one DHT metabolizing enzyme: 3α-HSD. So this time, let’s focus on 3β-HSD. Theoretically, if we increase 3β-HSD, then we should increase DHT metabolism, and in doing so, maybe help fight hair loss… Right? Unfortunately, evidence is mixed on whether increasing 3β-HSD will actually decrease DHT levels or have any impact on our hair. In fact, other researchers have even stated that abnormal expression of any of these DHT metabolizing enzymes (3α-HSD, 3β-HSD, or even 17β-HSD) might increase scalp DHT… and possibly even accelerate the balding process! Why is this the case? How is it that increasing enzymes that metabolize DHT can also inadvertently increase DHT levels? That seems paradoxical. It is. Until we refer back to our chart and realize that even if we increase DHT metabolism, we might not decrease DHT levels. Why? Because DHT can recycle back into itself. After DHT is metabolized by the enzyme 3α-HSD, that metabolite only requires a single enzyme to then convert back into DHT. That enzyme: 17β-HSD. That’s a one-step recycling process back to DHT. Well, if DHT is metabolized by the enzyme 3β-HSD, this whole step-process is much longer and requires multiple enzymes. But… the DHT recycling can still happen. Increasing 3β-HSD will help fight hair thinning. So I’ve excluded this enzyme (and a couple others related to DHT metabolism) from the flowchart. Should We Increase DHT Metabolism To Lower DHT (And Keep Our Hair)? The truth is that we barely understand these enzymes, and even less so their relationships to pattern hair loss. And while there’s evidence that increasing DHT metabolism via 3a-HSD can promote hair growth in rats – we’re not sure yet if this will carry over to humans. The good news? Within expected doses, sulforaphane appears to be safe. If you want to include a sulforaphane supplement or sulforaphane-containing foods in your diet, go for it! It’s not hard to find broccoli sprouts at the grocery store. And it’s pretty easy to grow those sprouts yourself. And the better news? We’ve just completed our final lever of our DHT Reduction Master Flowchart. We can now add DHT metabolism to our flowchart. So without further ado, here is the completed Master Flowchart For DHT Reduction (click to enlarge). Now let’s put this chart to use. Are you considering any DHT-reducing supplements to include in your fight against hair loss? Use this chart to better understand how these supplements work and if they’re worth trying. Better yet, use this chart to customize a DHT-reducing plan to maximize 1) your angles of attack, 2) efficacy, and 3) safety. For example, which approach do you think is better? First Approach: you want to reduce DHT levels to fight hair loss, so you buy ten different supplements. Every single supplement does the same thing: it targets DHT by inhibiting the enzyme 5-alpha reductase. Second Approach: you want to lower DHT levels to fight hair loss, so you buy ten different supplements. One supplement that inhibits 5-alpha reductase indirectly, one supplement that increases the expression of androgen-binding proteins (S-Equol), one topical that targets 5-alpha reductase through lipid bilayer permeation (pumpkin seed oil), one supplement increases DHT metabolism, and maybe one experimental topical possibly increases tissue oxygen levels in the scalp, and in doing so, maybe decreases androgen receptor expression. Both approaches likely cost the same. But I’d bet your money is better spent on the second approach. Why? Because you’re not just targeting one lever of DHT reduction. You’re targeting all four. In doing so, you’re 1) targeting hair loss from multiple angles, 2) not hammering any lever too hard, and as a result, 3) likely spreading out your risk for side effects. The big takeaway: we can target DHT more broadly by targeting multiple levers, rather than many supplements that only target the same lever. And now that we’ve covered this, here’s a cold hard truth about DHT and hair loss. Should We Target DHT To Reverse Hair Loss? Maybe not. And here’s why. Yes, Finasteride can plummet DHT to near-castration levels. And yes, castration (and Finasteride) have an incredibly high success rate for stopping pattern hair loss dead in its tracks. 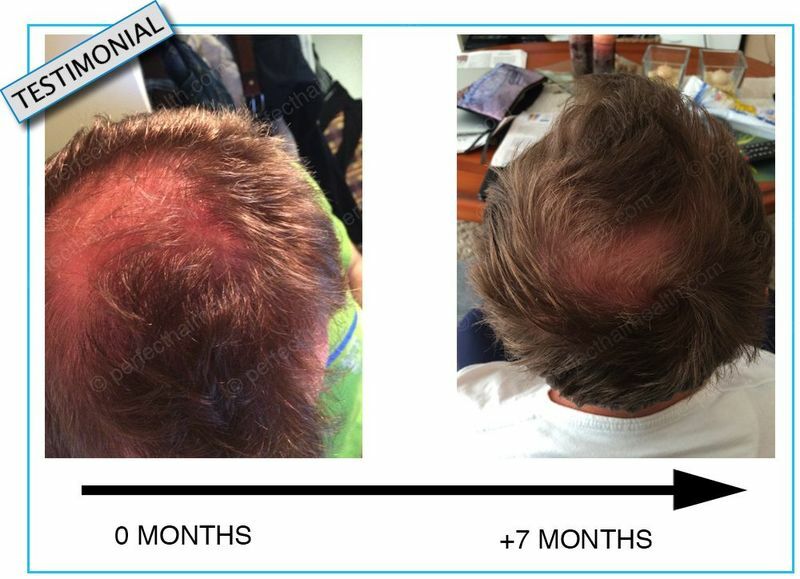 But here’s the catch: those taking Finasteride don’t see full hair recoveries. Rather, the regrowth that they get is modest, with some studies showing merely a 10% increase in hair count over 48 weeks. That’s not very impressive. And it begs the question: if DHT causes hair loss, then how come after we take away DHT, all of our hair doesn’t grow back? How come our hair loss only stops, or our hair thickens a bit, with some minor recovery in recently lost hairs? No researcher is asking this question, and I don’t know why. Maybe it’s because pharmaceutical companies are financially bound to the DHT-hair loss connection. Maybe it’s because nobody really cares to answer this. Maybe it’s because in most scientific fields, 90% of funding goes toward treatment testing and just 10% goes toward understanding the pathology of a disease. The end-result? We’re all shooting in the dark, clawing to create the best treatment for a condition we barely understand. But if we take a step back, and look at DHT’s relationship to other conditions – like heart disease, atherosclerosis, and wounding-healing – one thing becomes clear. DHT plays a causative role in the formation of two conditions: fibrosis and calcification. And unsurprisingly, fibrosis and calcification are observed all over balding scalps. These conditions reduce blood flow, oxygen, and nutrient supplies to tissues. And if we take away the triggers of fibrosis and calcification (like DHT), we don’t take away the damage already done to those tissues – and the scar tissue already formed. Maybe if we want to reverse hair loss and see full hair recoveries, we need to focus less on DHT, and more on ways to reverse calcification and fibrosis. Yes, DHT-reducing drugs, foods, supplements, and topicals will help slow or stop hair loss. Yes, maybe they’ll grow back a little bit of hair. And yes, maybe they’ll cause some sexual side effects (after all, DHT is critical to male sexual function). But if we want full hair regrowth, we better develop ways to undo the damage already done. And that means we better find ways to reverse calcification and fibrosis. I bought the complete package rob. Do I get like a special email where I can contact you? or is it the same for your customers? Hey Michael – it’s the same email for everyone. But you should use the additional PDF to schedule a Skype session with me right away. I look forward to meeting you! Rob really good work again . I would like to share something with you all . My uncle is a head consultant at his hospital and has been in the medical industry for 30 years. He teaches new doctors and is a specialist in his Field. I recently asked him about the FDA and how the y approve drugs ( such as Fin). He told me plainly that the FDA cannot be trusted, and they have been known to take certain privelegas from medical companies for market and money. Which may explain why fin is expensive and dangerous. And I’m now Even more certain that DHT might not even be worth tackling when inflammation might be the real culprit. Thanks Paz! I believe the story. The other side is that 90% of disease research funding goes toward treatment testing, not necessarily studying the cause of the disease. That’s a huge problem. It’s why we have so many FDA-approved drugs that only manage the symptoms of a disease, and not necessarily the cause. It’s a frustrating point when we have the resources to study these diseases correctly, but we just don’t allocate the funds to the right place. What about supplements or methods for reducing estrogen ? as you’ve discussed before about the testosterone:estrogen ratio. I’ve also read that high estrogen levels is associated with frontal hairloss in men. I’ve bought your 2nd package since it came out and have performed the massages resulting in a loser scalp and made the diearty recommendatios but I still shed in the frontal areas. …But I haven’t heard of the high estrogen-frontal recession connection in men (at least not explicitly in the literature). So I’d love to read your sources if you have them on-hand. Regarding your shedding — could you describe it a little more? Shedding is generally fine, but if that shedding is resulting in visible thinning/recession, then it’s time to reevaluate. Have you experimented with the troubleshooting guidelines in the book? OT: You seem to have a talent for tackling tricky subjects. If you ever get tired of studying hair loss, why don’t you pick that other big subject that runs parallel to it (at least, in the “lookmaxing” community), i.e. facial bone structures, jawlines and improving them though exercise, diet and supplementation? I’d love to read something from you, with your typical rigor, on the effects of, say, vitamin K2 on arches and cheek bones. Thanks Alberto. I’ve inadvertently learned a lot about other fields just as a result of diving into hair loss research. I think a huge problem with the way our medical (and research) fields are currently set up, at least in the US, is that experts across fields rarely talk to each other. For instance – an expert in cardiology / heart disease almost never shares his or her research with an expert in hair loss… despite the fact that etiologies of both heart disease and hair loss involve DHT. Another example: one my friends is an environmental engineer with an emphasis in water treatment systems. He’s in the process of patenting a purification technology using UVA/UVB rays to photodissociate heavy metals and drug nanoparticles from tap water. He discovered this technology already existed in another field of research, but that nobody had applied it to his field with that sort of purpose. In fact, the technology had been around for decades and yet water scientists had no idea… all a result of a lack of information sharing. I’ll keep your note in mind, and if I ever start anything broader than hair loss research, I’ll be sure to let you know! A few years back I looked into the relationship between K2 and facial structure. A lot of the evidence on the positive relationship between “wider faces” and K2 consumption came from Weston Price, and when I dug deeper into the data, I found it was hard to discern whether wider-set faces were actually due to K2 alone, or whether this had more to do with higher overall neonatal / post-natal testosterone levels of the subjects + K2, or even the fact that these children who developed wider faces also ate harder-to-chew foods in their early development that could could’ve contributed to stronger jaws / more pronounced facial features. I never dug deep enough to get a solid answer! If I had to guess, I’d say all three of those factors (K2, higher testosterone (via more sun exposure, diet, etc. ), and harder-to-chew foods) all contributed to facial structure. Alot of hype has been created by people who do nofap over at reddit. However some people on noFap have resulted both regrowth of hair….And Hairloss at greater levels while on NoFap. The idea is that Once you go on NoFap … DHT increases at higher levels ? Which result in more loss due to the levels of tetostrone in the body? . Does this mean that Nofap can lead to hairloss and regrowth ? like a double edge sword. Hey Praz – I’ve always maintained that there’s not enough evidence to condemn masturbation as a hair loss driver. And to your point — there are certain population subsets who abstain from masturbation for years, and still go bald during that abstinence time period. In my opinion, it all depends on the individual. Hi Rob I will post my month 7 results tomorrow in the comment section and email. I have a serious question regarding DHT. I have read in few comments on some articles which got me thinking. Is DHT needed for regrowth? And could the use of DHT blockers be slowing progress ? Natural blockers included…? Could the opposite be true ? And that just by tackling calcification , and inflammation we gain more results than blocking dht. And that more dht , will allow more regrowth. I know it sounds far-fetched, but I’m going by the assumption of DHT being present in balding and non balding scalps. And growing hair elsewhere on the body. Thank you! I look forward to reading and seeing your month 7 results. It’s a great question… and one we can’t yet answer (at least until we have more research). What we do know: androgen receptors and scalp DHT are higher in pubertal hair (the body and face). And paradoxically, DHT is higher in balding scalp tissues. The gravity theory of baldness makes the argument that DHT is necessary for hair regrowth, and that hair loss is rather a consequence of DHT’s effects on subcutaneous fat erosion. However, the theory has its flaws. I’ve been thinking of organizing crowd-fund toward a research team that would help answer our questions. By better understanding the etiology of hair loss (and by attempting to answer the paradoxes within the DHT-hair loss argument), we’ll fast-track ourselves to a universal cure. Unfortunately right now — the overwhelming majority of hair loss research leans toward testing treatments, and not toward understanding the causes. I`m really sorry, this question is totally off-topic, but I don`t know right now how I could reach/contact you in another way. I`m totally convinced, that your approach is the right thing to do, so I want to continue the massages, but I really would like to hear your opinion and advice on this problem! In terms of scars or stretches, I haven’t had anyone report any scarring from either dermarolling or massaging. Hey Rob, This runs in my family — hereditary androgenic alopecia. Also, my hair itches a lot and I am currently using a dht blocking shampoo. Will your technique help me? I just bought one of your packages. Thanks for your support. The packages are all catered toward stopping and reversing androgenic alopecia — which is what I was diagnosed with back in 2007. Please keep me posted with your progress, and I look forward to your results! Also, the video — is that you demonstrating the technique? The reason I’m asking is that you have great hair; however, does alopecia (hair loss) run in your family as well? Thanks Rav. That’s me in the video! Androgenic alopecia runs on both sides of my family. Every male on my mom’s side of the family is bald. Every male on my father’s side of the family is bald (except for my father!). I’m doing a report for school and I was wondering if I could get your last name to be able to reference this site fully for my bibliography. Sounds kinda shady, I know but having the author’s name helps to boost marks in researching. Hey JJ — thanks for reaching out. I keep my last name private and off the site, but if you send me an email, I’d be happy to provide it for your report. I’m almost sure you’ve seen this, but here is an article regarding 3b-adiol. The gist of the article is that 3b-Adiol should be higher than DHT + 3a-Adiol. Also, luteolin seems to have gained some attention with regard to reducing inflamation. Great find Bill! Thanks for sharing. I hadn’t read that research. I’ll take a look and will incorporate anything relevant into future articles. Hey Rob. If inflammation is a major culprit in the thinning of the hair follicle from DHT, wouldn’t applying Copaiba Essential Oil to the scalp where it’s thinning be good, since it’s one of the strongest anti-inflammatories in the world?? Would you recommend to buy sulforaphane online or from a health shop and how do you know if it’s the potent stuff in terms mgs? Hey Enrique — you can try getting sulforaphane through buying broccoli sprouts at Whole Foods, local health food store, or farmers market. Conversely, you can also go the supplemental route. I have no recommendations on which brands or dosages are the best — but if you try one and find it helpful (or not), please feel free to share it with everyone here! What is 3b-adiol known as I can’t seem to find any medication with that name?? I can’t seem to open the link? What does 3 beta fool do to dht ? Hey Enrique — it’s explained more in the article, but 3 beta-diol is one of the metabolites of DHT. It’s a byproduct of DHT. It doesn’t necessarily do anything to DHT. Rather, it’s a hormone that’s made from DHT. I need your advice I am a 22 year old man (although I am transgender man-to-female) I want some advice on lowering testosterone and or DHT, I am on the gender clinic waiting list how ever it will be next year between July and November before my first appointment and I need some help now! I am losing my hair to male pattern baldness at an alarming rate it has receded at the front temples almost completely in just 5 months and it is thinning all over the top I started at 17 but has got much worse. I was on Finasteride in January this year but did not like the side effects so stopped after a month I was then on Saw palmetto for 7 weeks but the dermatologist said it was a waste of time and money(It did not stop ether). I was thinking of Cyproterone acetate as I want to stop testosterone in general but there are side effects worse that Finasteride don’t get me wrong I will take them if it’s the only way to stop the balding. I was thinking could Oestrogen or Progesterone stop the balding as they are more natural and with less side effects(I know there is the breast growth) but I am ok with that as it will aid my transition. Can I stop or lower DHT or testosterone naturally ether with a diet change or cutting out the sugar or fat. There must be a way. There must be something that could be to do with diet as in terms metabolism when it come to DHT conversion or is there something to with sugar and blood glucose level that causes the build up. Do things like peppermint oil work. Thanks for reaching out. I’m currently writing an article related to this — about how male-to-female hormone replacement therapy has resulted in full hair recoveries for patients, and about how this is explainable given what we know about DHT, calcification, fibrosis, and bone remodeling. Your clinic will be more helpful than I can in terms of recommending drugs / supplements to aid in your transition. MTF transgenders are in a bit of a bind when it comes to taking measures to lower testosterone naturally — because typically, things associated with decreased testosterone also negatively impact health. For instance, sleep deprivation, alcohol consumption, and no sunlight are all technically natural ways to reduce testosterone production — but they all carry unintended consequences to longevity, mental acuity, and disease states. As a result, I’d recommend staying patient, and then working with your clinic when the time comes for your transition via hormone replacement therapy. You’ll likely experience incredible amounts of regrowth — many MTF trans people do. I’m assuming you’ll be prescribed a form of estrogen (estradiol) alongside anti-androgenic drugs like spironolactone. These drugs alone will help in bone remodeling, and thereby regrowth. I’m not really up on your material, but this is just me thinking after reading this. In other places I’ve read that DHT is vital for men’s health…And increasing it should be men’s goal. So what if DHT is higher in balding scalps because it’s the body’s way of fighting hair loss or calcification and inflammation. If calcification is higher maybe the body increases DHT in effort to slow hair loss to keep from falling out quicker. DHT may be lower in scalps of men with fuller hair simply because they don’t have high calcification. Have Dave! Increased DHT in balding scalp tissues is most likely just a biological response (and attempt to resolve) chronic inflammation. Unfortunately, DHT in the presence of the wrong signaling proteins (like transforming growth factor beta 1) ends up causing fibrosis (scarring), which leads to hair loss. For pattern hair loss sufferers, DHT + TGFB-1 likely drives much of the miniaturization process. So in a way, hair loss progression is essentially just a set of unfortunate missteps (the body’s attempt to resolve chronic inflammation, only to end up forming scar tissue instead). Some of the effects of dht in men.. Assuming all the above is true I can’t see how dht contributes in any way to hair loss..at least in men. Hey Dave — thanks for your comments. I responded to a few of your other comments, which should help you become familiarized with the research on DHT and hair loss — and the misconceptions behind the DHT-hair loss hypothesis. Hey sorry I don’t mean to keep filling your comment section but I just found this article. So then maybe the assumption that bald men have higher dht is false. There is just so much Estrogen in the Deit so basically you can barely eat most foods to avoid the high levels of Estrogen. Also it appears like minor infections around the Hair Seeds can kill hair, and also Oils, like the Oils produced with High Levels of T! So maybe making sure the pores for the seeds aren’t clogged, not infected and properly stimulated with Oygen and Blood Flow would work better than killing DHT. There has been many Accounts of guys with really high DHT having good hair at an old age, probably because the high levels of DHT kept there Estrogen it interacts with low, while they had high DHT because of the lack Estrogen in their Deit. I found this article by trying to research Broccoli, and now I know to stay away from it because I don’t want to metabolise DHT, I want to pump my DHT up because it’s low due to all the crap in my deit, and am going on a T boosting Deit! I’m going to put Vitamin E Oil on my hair shortly because it beats up Testosterone Receptors but has other good T Benefits, however by the time I get it I’ll probably learn some Reasons not to use it. However my current Deit I’m beginning is just high grade beef, white potatoes and Sorghum, with Creatine and Pine Pollen, with a tiny bit of real butter, salt and a pinch of raw honey, with B3 & D3 Vitamins, which will be a bland and boring Deit to stick to. So I need to find a few more things that don’t conflict with T or DHT and have zero Estrogen to add. However once I pump my T and particularly DHT up I can eat a few more things in moderation. I need some serious help at the moment and my plan for the time being at least is to block DHT. I was wondering if you were to block DHT what would be your treatment plan? For myself i was thinking of using RU, although i had heard some guy died of heart failure using this as it eventually reached the heart receptors and shut it down, so maybe not then. However thanks to your flowchart, i will look at hitting DHT at all angles, so for each angle i am confused as to exactly what treatment plan i should bring myself on, i’d love your opinion on this, what exact products would you use for each angle of attack? I’m not currently on a DHT-reducing plan, but for me, it all starts with trying to reduce chronic inflammation. One pillar that isn’t mentioned in the DHT flowcharts: tension. Chronic tension can induce an inflammatory cascade, and that tension can induce hair loss. This is part of the basis for the paper I recently published. And Dr. Brian Freund’s botox-hair loss study (among others) all suggests that there’s a potential for tension release to reduce DHT in scalp sites. I’m currently working on updating the book and site again. I’ll be sure to include a product list for each angle of attack — since this is something a few other people have asked for, and it’s a very reasonable request. So thanks for letting me know. This DHT master series is amazing! Thank you so much for putting the time to figure these areas out on dealing with DHT. Yes very true, seems like DHT may not be the best way to deal with hair loss, rather, we should be focusing more on breaking up calcification and fibrosis which i was thinking how exciting and interesting it could be to write up a new series like the one here but for different angles of attack against calcification and fibrosis. I’ll start with some of my ideas for this, perhaps when it comes to breaking up this inflamation in the scalp, maybe going in a sauna would be a useful way to facilitate the wound healing process for the scalp as saunas among many other benefits relax the muscles and relieves tension throughout the body, in this case the scalp? Theres also different saunas like an infrared sauna that helps flush the toxins out from the skin at a deeper level, maybe an infrared sauna could facilitate wound healing in regards to calcification and fibrosis. Another idea was using hot and cold therapy like compressing ice against the scalp and then applying a hot towel afterwards, this brings the blood flow back up and could overtime break up the fibrosis in scalp? Of course i understand there is no study to determine the truth in this, but it kinda makes sense, whats your thoughts and perhaps these are worth the try anyway? Thanks for reading! And I’ll certainly consider putting together a series for reversing fibrosis and calcification. Ironically, these are two of the hardest-to-reverse conditions that we know of in medicine — which is why it should be no surprise that they’re present in so many chronic disease states. Thermal therapies (compressing ice, hot towels, etc.) might help to improve blood flow, and even potentially reduce the amount of free testosterone that converts into DHT in balding scalp tissues. This is because blood carries oxygen, and free testosterone requires additional moles of oxygen to convert into estradiol than it does DHT. So the more oxygen –> the higher the likelihood a conversion to estradiol (which tends to be pro-hair in scalp tissues). And the lower the oxygen –> the more likely it is for free testosterone to convert into DHT since DHT doesn’t require oxygen for the conversion to take place (and DHT in the scalp tends to be anti-hair). So it might help, though it’s unclear by how much. The fibrosis and calcification stuff are a lot more complicated. Mechanical stimulation is one potential target. Tension is another. I’ll have more information on this in the future! It’s a great question! The short answer is that overall health and hair health aren’t perfectly correlated. After all, many professional athletes still lose their hair — so there has to be other factors involved. And there are. When we look at the balding process, it’s extremely localized — i.e., only in areas above the galea aponeurotica (which is the dense fibrous membrane that stretches over the top parts of our scalps). There’s evidence that the balding process (which starts with inflammation) might in fact be mediated entirely by chronic tension — either in the galea aponeurotica or the skin. A response to tension is inflammation; a response to inflammation is DHT; and a response to chronic inflammation is eventually scarring. This means you could eat the healthiest diet on the planet, exercise daily, but if you have a genetic predisposition to respond to chronic inflammation with DHT, and the scalp structure for chronic tension, you might still go bald. Conversely, there are some overweight, out-of-shape people with absolutely no scalp tension at all. I am a 48 year old male who has suffered with the hair loss nightmare since my early 30’s. I have had 2 hair transplants, One in 2007 ( 3,500 FUE ) and another in 2009 ( 4,500 FUT ). Following each procedure the transplanted hair grew out timely and as expected, however, once the transplanted follicles reached full maturity they began to slowly deteriorate and miniaturize and fall out. As of today I am left with LESS THAN HALF of the transplanted hair that grew so beautifully after each transplant surgery. The hair that I have lost is NOT native hair! It is transplnated hair and that has been confirmed by 3, YES, THREE hair transplant surgeons! Watching my transplanted hair slowly fall out over the past ten years has literally driven me to the point of insanity, and guess what??? None of the countless hair transplant surgeons that I have consulted with in the past 5 years can give me an explanation as to why this is happening! Everyday single day of my life is a DEPRESSING, EMBARRASSING NIGHTMARE!!!! I am new to your forum and your work and from what I have read so far you are more knowledgeable about hair loss than any of the hair transplant surgeons that I have worked with! I look forward to using your knowledge and your techniques in a last ditch effort to save what transplanted hair I have left! Are you currently taking finasteride or minoxidil? If so, for how long? And have you been taking them since your procedures? Hi Chris , this sounds awful. Robs links and paper will help you determine the cause. blood flow and scalp tension/ and expansion. The poster was ridiculed with abuse, and the main counter argument was that hair transplants work ! But you are definitely not alone. Many people who have undertaken this procedure have also lost their new transplanted hair , including celebs. For the same reason that the area of scalp is riddled with calcification , fibrosis and inflammation. Which eventually starves the healthy follicle over a period of time. This is why Fin is distributed by clinics after procedures. This is why some people say that their transplants were a success five or seven years in, because they are on medication or the procedure was able to cause a certain amount of wound healing . I believe this is dependent on individual. I hope you stay in touch and update us on your progress. I understand that your concern is the goitrogenic effect, but if someone were to say consume broccoli sprouts (very high in Sulforaphane) and also eat a sufficient amount of iodine, would this actually be a problem? Wouldn’t it be beneficial? I actually must apologize for this comment. I issued a question before fully readinng the article. I realize I am being lazy now, but as a summer, is there an “noninvasive”, DHT-blocker you can recommend? I am about to try a laser therapy and want to combine it with a simple (yet good) DHT blocker, but there is no way I am going to go on finasteride.